Along with heredity, hormones may influence your weight. While healthy women produce both estrogen and progesterone during the reproductive years, some women must take supplemental hormones for various reasons. While individuals taking hormone supplements can react differently to progesterone, this hormone probably will not help you lose any excess weight. Progesterone is a hormone that occurs naturally in female bodies while progestin is the synthetic version of the natural hormone. Progestin, commonly referred to as progesterone, produces results similar to the naturally occurring hormone. While progesterone can affect your appetite and lead to a change in weight, the result is usually an increase in pounds, rather than a loss of weight. Progesterone plays an important role in sustaining pregnancy. While many women produce enough of this hormone to support a healthy pregnancy, some women may require therapeutic doses if their natural levels are low during early pregnancy. 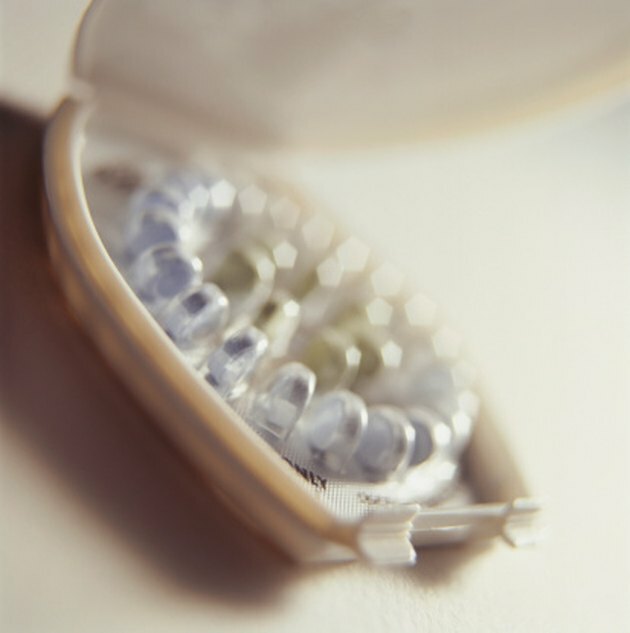 Synthetic progesterone also plays a role in preventing pregnancies when included in birth control pills. As an ingredient in birth control pills, progesterone can trick your body into thinking you are pregnant, reducing the risk of conception. Doctors may also prescribe progesterone to treat other conditions such as anemia, cancer, acne and menopausal hot flashes. Progesterone can cause an increase in appetite. In fact, medical treatment for loss of appetite and loss of weight in AIDS patients and cancer patients may include hormone therapy with progesterone. This therapy can help the body produce proteins that may help increase appetite and lead to subsequent weight gain. In addition to possible weight gain, women taking progesterone may notice slight bleeding between menstrual periods and an increase in body temperature. Taking hormones, such as progesterone, may increase your risks of developing blood clots. Blood clots can lead to heart attacks and strokes. Symptoms that require immediate medical attention include severe and sudden headache pain, changes in speech, vision problems and numbness or pain in your chest, leg or arm, as well as shortness of breath. Don't count on your progesterone supplements to help you lose weight, and don't be surprised if you gain a few pounds while taking progesterone. Keep your body at a healthy weight by increasing your level of exercise and restricting your consumption of sweets, fats and empty calories. By cutting out about 500 calories per day, you may notice a gradual decrease in weight around 1 lb.each week. Regular exercise that burns an additional 500 calories per day may increase your weight loss to about 2 lbs. each week.